Today is the big day! 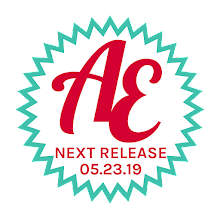 We over here at Avery Elle are excited to be part of this exciting event. We have partnered with 15 other stamp and papercraft companies to do a special blog hop and will be giving away 16 prizes to 16 lucky winners! IN HONOR OF THE HOP WE ARE OFFERING 10% OFF ALL PRODUCTS IN OUR STORE NOW THROUGH APRIL 29th. USE COUPON CODE HOP10 AT CHECKOUT, WWW.AVERYELLE.COM, TO REDEEM. I created a fun tag in honor of the event. I used some of our products along with Therm O Web's deco foil, their foam adhesive sheets, deco foil pen and some of their adhesives. 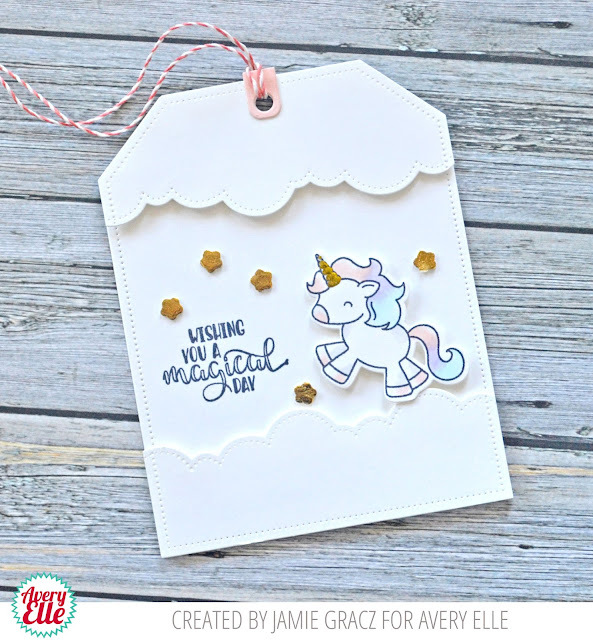 To create this tag I stamped and die cut images from our Be A Unicorn Stamp Set. I used the deco foil pen to color in the unicorn horn and then placed the gold foil (silver side down) on top of the area that I colored in. I ran the stamped unicorn and foil sheet through my Big Shot to make sure that they were well adhered. After peeling off the foil I had a beautiful gold horn! I die cut the small stars out of the Therm o Web deco foil foam adhesive sheets and then peeled back one side of the backing of the sheet. Once again I placed the gold foil (silver side down) on top of the sticky side of the star die cuts and ran these through by Big Shot machine. After peeling back the foil I had these gorgeous gold stars that were ready to be stuck to the tag base. The shine of the stars and the horn are just gorgeous and how cute is this cloud jumping unicorn?! I love it! You are at stop 2 and should be off to Our Daily Bread Designs on stop 3 next!! Love the use of the Deco foil. This inspired me to try the deco foil. I have this stamp set and I have to say It is one of my favorites! love the soft springy tail! sweet stamp set! great giveaway! I love Avery Elle Stamps . This Unicorn stamp is in. A must have! Thanks for the inspiration on foiling. I used this for my daughters wedding invitations. They came out beautifully. I want to try out Deco Foil so bad!!! Cute Tag! That unicorn stamp is so cute. I need it so I can make cute girl cards. What a cute tag-will have to try this! Super cute tag Jamie! Love that little unicorn! Great use of foil too! I love the dimension and the ink colors. Great tag; love the unicorn and the floating clouds! Adorable tag, love the cute unicorn and gold foil. Love the gold accents on your cute tag using the deco foil. I'm all about deco foil and I wasn't aware that there is a deco pen. How fun!! The little unicorn is adorable. Thanks for sharing. I love using deco foil. I usually just use it for words. I have that pen! I must try this idea! Adorable unicorn! Can't wait to add this to my stash! Thank you for showing how to use just a touch of the foil with the pen. Great technique! I want the unicorn, I want the foil, I want all of this. I love love love this stuff! So excited to play around with the deco foil:) just got some...yay. The unicorn is adorable. Very fun tag and great use of foil. Really cute little tag. the gold foil is the perfect touch. Thanks for the tip on creating the stars. Love the soft colors and the cloud border! The foil is so clever. nice tag.what a cute card love the colors and the unicorn. oh I love the Decofoil on the little Unicorn horn! Brilliant idea! I must use that! Decofoil is a product I've bought and haven't used- now I've got some ideas. Thanks. Love the use of the Deco foil and the cute card. Darling tag! Need to try using foil. Ohmigosh - the unicorn is too, too cute! Just ordered the stamp/die bundle and tweeted about it. Love it! So cute have not tried foil yet. 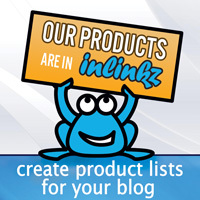 A blog hop of great craft sites. What a great idea! I LOVE that unicorn! Love how you layered the clouds too. Awesome tag! Adorable Little tag! Love the foil. Foil seem to be the in thing. Cute. Such a cute tag! Very nice to have detailed directions on how to use the deco foil! Thanks. LOVE this adorable tag....so cute!!! I've never used Deco Foil. Is it wasy to use? I bought the Deco pen quite some time ago and it is still in its packaging. You have given me a reason to get it out and try it. What a great accent. Oh, to be a rainbow unicorn! What an awesome card. The foil was interesting and fresh. Love the look of foil. Unicorn is super cute. I would love to try deco foil but would not know where to start. That unicorn is so sweet, I love it! Thanks for a fun blog hop! The unicorn image is so cute! Super sweet little unicorn tag love it! I have tons of foil which I love, but have never been successful except with adhesive foam sheets. Now I want to try "coloring" with glue & adding foil like you did for the horn--so cute! such a cute tag :) love it!! Thanks for this lovely blog hop. Cute tag! I love the foil on it. That tag is SO much fun!! Unicorns are so popular right now. Lovely little tag. Thanks for sharing. I love this tag... So cute with that unicorn and the deco foil is fun to use on projects! Adorable! Love the foil accents. Cute unicorn! Love the added sparkle of the foil. I love the design of the tag itself. The image is so cute too. Like the use of foil. So adorable, love that stamp set! The deco foil look like neat stuff ... I'll have to look into this! I justvlove your pretty tag! Thanks for taking part in the blog hop! This is such a cute tag! I love the foil use. I like your use of the foil just on the small accents. Cute Tag. I need to add the unicorn stamp set to my wish list. Super cute tag!! Love this cute unicorn!! I do believe in unicorns! How adorable. Adorable little tag - I think I have to try some of that Deco Foil! Love that unicorn. Very sweet tag. Cute tag and the stamp set is too. Cute card and the added touch of gold makes it special. cute tag - perfect for any gift! This little tag is simply "magical!" Love the whole design! This would be such a special tag for a little girls gift. It's so so cute. Such a cute card/tag. I love unicorns and have collected them since childhood. Love the tag with clouds and foil. So cute. Thanks for your support of the Blog Hop with Technique Tuesday. Really like the foil but love the unicorn more! Love the gold foiling. That's a technique I want to try. I love the little whimsical card. I love the stitched clouds! love the magical little tag! This tag is adorable. Would be nice in a nursery too! Fun hop! Thanks for sharing. That sweet unicorn never gets old! Happy spring hopping! What a cute tag, adorable!! The foil is perfect for that adorable unicorn. What a adorable tag! I really need to watch some video's and learn how to use that foil because it looks so nice on your tag! Thanks for sharing and giving us the chance to win a prize! What a cute tag....love that unicorn! That is a darling book mark and the gold awesome. Very cute little unicorn! Your stamps are always so cute. I've never foiled with my Big Shot, thank you for sharing and participated in the blog hop. Adorable! 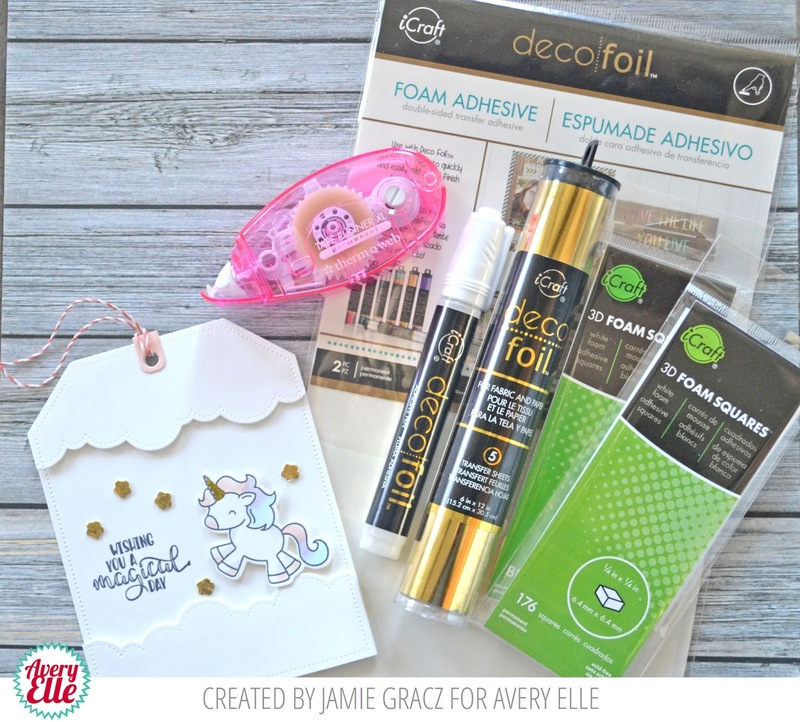 I love Avery Elle, and I love Deco Foil, so this is win-win! I haven't tried the foil pen yet. Great idea for little details of foil! Such a cute tag. I've never foiled with my Big Shot and would like to try this someday. Thanks for sharing. that unicorn is way too cute! Love this adorable tag! Thanks so much for the great instructions on how you made it. I didn't know you could use the Big Shot for foiling. Will have to try it! Your tag is aforable! I've never tried foil! Really cute tag! Love the design. How sweet is this tag? I love the little clouds and the use of the deco foil on this! Great design!! I love that foil is so easy to use! Super cute!!! That cute little rainbow unicorn is magical. What a darling tag and love the unicorn - perfect for spring! So cute with the unicorn. I like how you used the gold foil. Such a sweet unicorn tag! The tag is so cute. Thank you for sharing!! Have never used the foil. Looks so pretty! Love tags, especially when they have unicorns. Love it. I love this cute unicorn stamp set! What a sweet tag! I love the clouds with the pierced border outlining the tag, The unicorn stamp is adorable! The top of your tag is so cute and so clever. I love it! What a cute little tag, love the unicorn. So cute!! Love using Deco foil on my projects! I like vet that little unicorn! Love the little unicorn. I want to make a little girl card with it! Love the look of foil! Cute unicorn, I will need to try the foil with it! Love that unicorn. Avery Elle always come up with adorable sets. What a magical unicorn tag. It's a magical unicorn! Very sweet- love the horn in gold! Thank you. Never thought to use my big shot for added pressure, thanks for that. Love how you layered the clouds! Really cute tag! So cute. I really like those die cut clouds, especially using one above and below! Fun!! It's good to see how well the foil works on even the most tiny areas/images! Really cute tag. Love the image and the foiling. Love how the foil jazzes up the tag - great idea! So cute! I need to learn more about that Deco Foil!! Such an awesome way to spring into Spring...with a great blog hop. Such a cute tag, love it! Oh my! I love unicorns and this tag is so lovely!!! I already follow your blog via mail. Love how you foiled the stars and unicorn's "top knot." I forgot to say that I shared this post on FB (Arianna Barbara) and on my Instagram page (raggiodiluc3). This tag is so sweet, top it on a present, and your ready to go! Very sweet tag! The cloud accents are pretty. Great tip for using the Big Shot to adhere the gold foil. I love this unicorn! The Deco Foil is a nice touch! I love this sweet unicorn! Tags are such fun mini pieces of art. Love this it. The unicorn is so sweet and who doesn't like a little sparkle. Cute card and great way to use the foil. I've got to try that! Love all the dimension in your very cute unicorn tag. One of my favorite stamp companies. I always forget about foil. Cute project. I love this unicorn stamp, it's so cute and reminds my of a stuffie! Such an adorable little tag! Love the foiling. Cute Cute Cute. The gold touches make everything perfet.